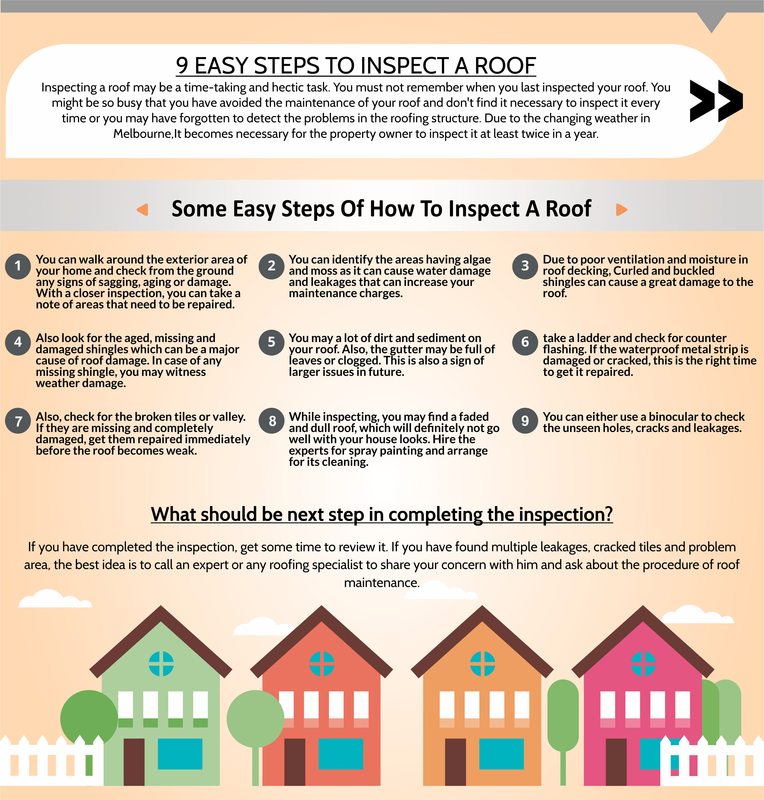 Inspecting a roof may be a time-taking and hectic task. You must not remember when you last inspected your roof. You might be so busy that you have avoided the maintenance of your roof and don’t find it necessary to inspect it every time or you may have forgotten to detect the problems in the roofing structure. Due to the changing weather in Melbourne, It becomes necessary for the property owner to inspect it at least twice in a year. When you feel a leakage or any hole, you can inspect it thoroughly or ask the experts to visit your home and let you know the maintenance works. Before a call a professional, by following these simple steps, you yourself can inspect your roof and notice the problematic areas in the roofing structure. It is quick, simple and cost saving as well. Step 1. You can walk around the exterior area of your home and check from the ground any signs of sagging, ageing or damage. With a closer inspection, you can take a note of areas that need to be repaired. By doing this, you can identify the areas that need attention. Step 5. You may a lot of dirt and sediment on your roof. Also, the gutter may be full of leaves or clogged. This is also a sign of larger issues in future. Step 8. While inspecting, you may find a faded and dull roof, which will definitely not go well with your house looks. Hire the experts for spray painting and arrange for its cleaning. What should be next step in completing the inspection? If you have completed the inspection, get some time to review it. If you have found multiple leakages, cracked tiles and problem area, the best idea is to call an expert or any roofing specialist to share your concern with him and ask about the procedure of roof maintenance. They can either suggest you roof restoration or repair after inspecting it completely. It would be a nice decision to fix the minor problems before they become disastrous for your family’s wellbeing. For a stress-free roofing maintenance, you can trust the roofing specialists in Melbourne and call them to take a visit to your house. Why hire a roofing specialist? It is a relevant question that why there is a need to hire a specialist. They can offer you the quality services at very affordable prices. For a standard and reliable maintenance, it is necessary to hire the recognized and popular roofing company to fix the problems without delays. Be careful while selecting a company and choose the best services to make your roof new and cleaned over the years.